At the moment most of the green vegetables or rather the indian vegetables are priced sky high. Nothing costs less than Ksh 200 and it does get a bit frustating especially even after paying so much, the freshness of the vegetable is missing. The greengrocers complain that they have no choice as their lorries are getting stuck for long periods because of the axle weight issue the government is trying to sort out with the transport companies. Yesterday, I didn’t get any fresh vegetables so landed up buying some brinjals. Not that they too were absolutely fresh but anyway looked better than the rest. So, I decided to make the most common shaak, ringad bateta nu shaak i.e. 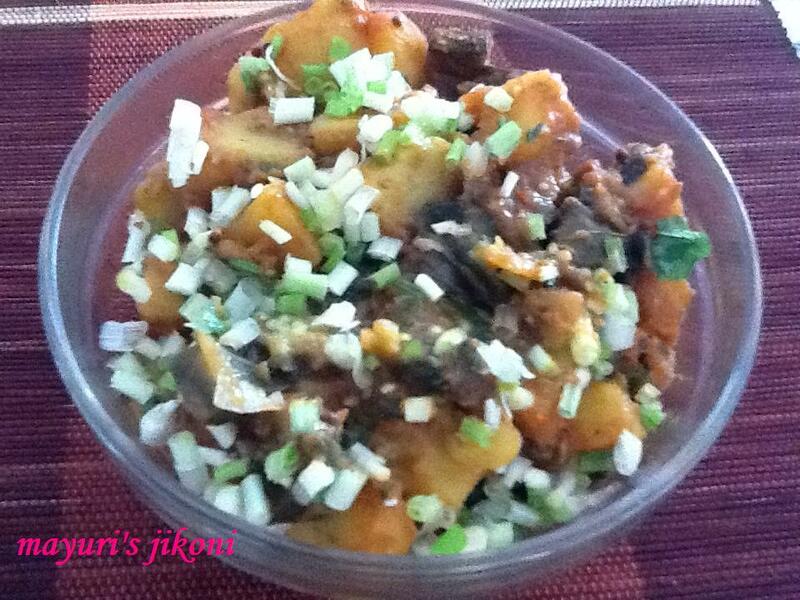 brinjal potato vegetable. Goes well with chappatis, parathas or even khichdi. Yummy and versatile. Make sure that the chopped potatoes and brinjals are in water till you are ready to cook. Without water both the chopped vegetables tend to turn brown very quickly. Heat oil in a wide pan over medium heat. When it is hot, add the fenugreek seeds. Let it brown a bit. Add mustard, cumin seeds, asafoetida and the ginger and chilli paste. Stir fry for few seconds. Add turmeric powder, red chilli powder and the vegetables. Add salt and mix well. Add the water. Cover the pan and cook the vegetables over low heat till done. Add the tomato puree, jaggery, dhana jiru, garam masala and cook for about a minute or so. Make sure you stir the vegetables to avoid it from sticking at the bottom. Garnish with coriander, fenugreek or spring onions and serve. If you need a bit of gravy in the vegetable then use 1 cup water. This time round I made it a bit dry using only ½ cup of water. Remember if you are using tinned tomatoes add less salt and if the puree is acidic, you may need more sugar or jaggery. Don’t use brinjals that have seeds in them. They will not cook properly. Add more fresh chopped fenugreek (methi) for a slightly different taste. Most of the spices and powders are readily available at any Indian grocery store. Lovely recipe! Thanks for linking it to The Veg Box event!